In 1826, just three years after the establishment of Macon, Thomas Gardner and sixteen other Methodists established the first congregation in the frontier town. Their first building was constructed in 1828 and in 1831, the Georgia Conference was established here. Georgia was a part of the South Carolina Conference prior to this time. This has earned the congregation the superlative “Mother Church of Georgia Methodism”. 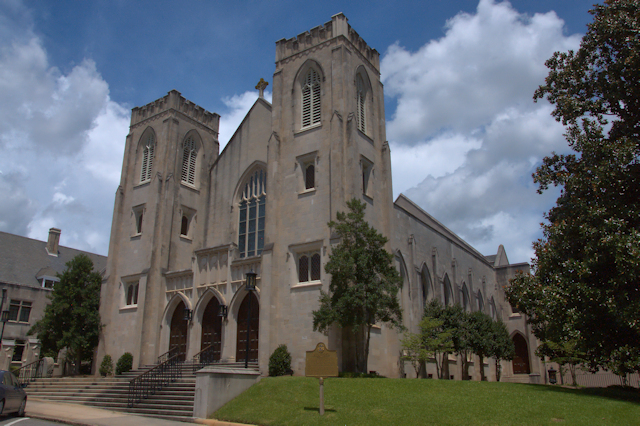 The Macon Episcopal Church changed its name to Mulberry Street Methodist Episcopal in 1847 and a new church was built in 1848. By 1882, an ever-expanding membership required more space and the 1848 structure was expanded and completely remodeled by noted architect Alexander Blair with an asymmetrical Victorian Gothic facade. The present English Gothic appearance of Mulberry Street United Methodist Church dates to a 2oth century remodel.